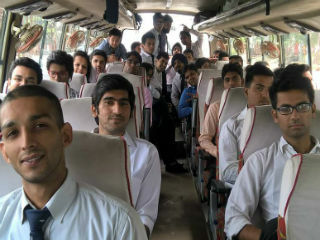 Students of PGDM- RM (2015-17) went for an industrial trip to manufacturing unit of Parle in Bahadurgarh on 7th Aug, 2015. Parle is an Indian private limited company. It owns the famous biscuit brand Parle G.
Ms. Pallavi, HR at Parle, gave presentation related to the history of Parle and its production. She also described the functions, benefits of the product and its presence worldwide. They also explained the automation of the plant which follows the highest hygiene standards. Students were taken around the manufacturing plant and were explained about the production and packaging process. Students also interacted with the staff of the Parle G Plant and were shown videos and presentation of its products. The process in the making is totally automated and is internationally designed keeping in mind the hygiene standards. Students enjoyed their bus ride and asked numerous questions pertaining to production and marketing. Overall, the activity was highly interactive and learning visit for the students on the concepts related to production and operations within the plant.